Kubuntu takes the credit for the user friendly installer. I won't be detailing each step this time, just a quick round-up: partitioning (auto, guided or manual), timezone selection, keyboard configuration, user creation (the last steps are done while the installation runs in the background). Booting Linux Mint 12 KDE takes about 40 seconds from GRUB to a fully loaded desktop but it is not a pretty sight: a few seconds of various glitchy graphical artifacts followed by a black screen. While totally unimportant for me, some may not appreciate the lack of a nice plymouth animation. "In Linux Mint 12 the boot splash screen is completely black. It doesn't show a logo with green dots as it used to. This is by design. 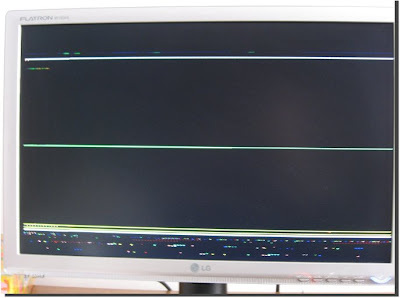 Once the system is installed the boot sequence is relatively fast. The black loading sequence doesn't look out of place and it looks consistent across all computers, whatever driver you're using." I was greeted by Mint's helpful welcome screen, which shows new users the way to various resources: a PDF guide, tutorials, forums, chat room, release notes, reviews, etc. This helps create a great first impression among new users. 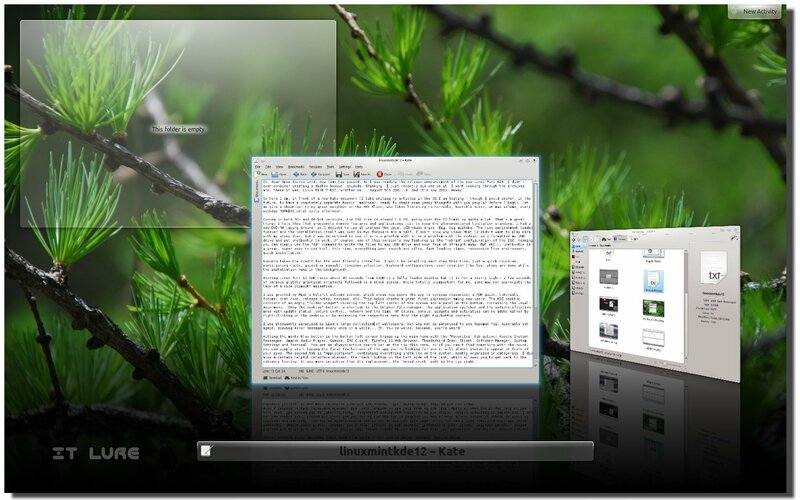 The KDE desktop consists of an empty "folder widget" covering the top left corner of the screen and a panel at the bottom, containing the usual: main menu, "Show the Desktop" button, a shortcut to the Dolphin file manager, the application switcher and the info/notification area with update status, volume control, network, clipboard tool and the time. 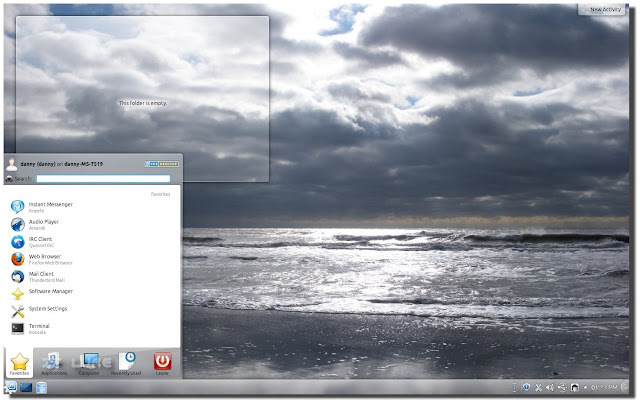 Of course, panels, widgets and activities can be added either by right-clicking on the desktop or by accessing the respective menu from the right top/bottom corners. I was pleasantly surprised by Lisa's large collection of wallpapers, but was not as surprised to see Nepomuk fail miserably yet again, spewing error messages every once in a while... Eh. You're weird, Nepomuk, you're weird! UPDATE: Rajit Vikram Singh noted in the comments section below that the Nepomuk service needs to be enabled and that is why it was yielding errors. To do that, go to the "Desktop Search" settings pane and check both boxes in the "Basic Settings" tab. Hitting the minty blue button in the bottom left corner brings up the main menu with the "Favorites" tab active: Kopete Instant Messenger, Amarok Audio Player, Quassel IRC Client, Firefox 10 Web Browser, Thunderbird Email Client, Software Manager, System Settings and Terminal. You get an always-active search bar at the top this menu, so if you can't find something with the mouse, you can simply start typing the first few letters of the app you're looking for and it will almost instantly appear in front of your eyes. The second tab is "Applications", containing everything installed on the system, neatly organized in categories. I did miss a certain helpful interface element, the "back" button on the left side of the list, which allowed you to get back to the category listing. It was more intuitive than its replacement, the "bread-crumb" path in the top right. 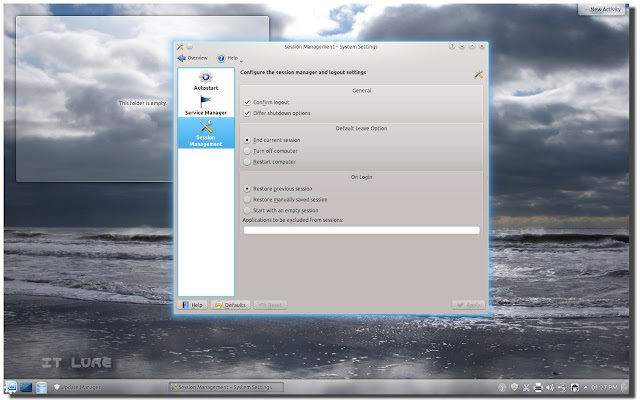 The third tab is "Computer" which lists 3 sections: the 1st consists of 5 relevant shortcuts to the inner workings of Linux Mint: Software Manager, System Settings, Synaptic Package Manager, Konsole as root and Run Command. The second section is "Places": Home, Network, Root folder, Trash. Finally, the third section is "Removable Storage". 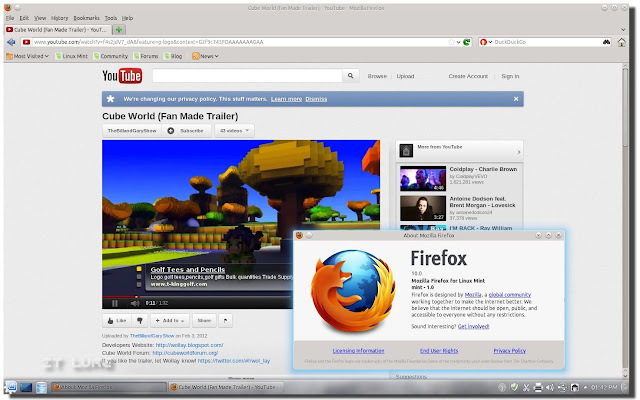 Main Menu's fourth tab displays both applications and documents that were recently accessed by the user. And the fifth one has the "Leave" options, either for the active session or for the whole machine: Logout, Switch User, Lock the Screen, Sleep, Hibernate, Restart, Shutdown. Oh, a funny thing: clicking the "KDE DESKTOP" button in the top right corner of the main menu brings up the www.kubuntu.org webpage. A default behavior of KDE, which I personally am not very fond of, was kept in Lisa as well; if I turn off my machine without closing every program and/or folder, the next time I turn it on, it will remember and bring all of them back up. Thankfully, this can be easily changed from the "Session Management" control module, by selecting "Start with an empty session". The out-of-the-box experience that brought Linux Mint its soaring popularity, is obviously kept in Lisa KDE: Flash, audio & video codecs, wireless support, etc. It even had no problem detecting and installing the proper driver for my Canon MP250 multifunctional. Before I dwelve into a bit more detail about what is included in Lisa by default, let me express a bit of rage over one particular aspect: the first-boot updates - FUUUUUUUUUUUU! So, after praising Linux Mint for a quick installation process, I was flash-mobbed by ~400 updates which took more than half an hour to install. My rage could arguably be regarded as an exaggeration, given that one could simply ignore them and let the system update itself while they are out. But still, such a fresh out of the oven ISO should be a little more up-to-date. I was happy to see GIMP ready to work inside the Graphics section, along with Hugin, digiKam or showFoto, all of them professional-level tools for photographers. The Internet category is well covered. I don't think I mentioned Ktorrent, a perfectly fine torrenting solution. There is also a Dial-Up tool, which is a bit odd in this day and age, but I hear there is still a good amount of households who are still forced to connect through this now ancient technology - so it may be a welcomed addition to Lisa's Communication tools. 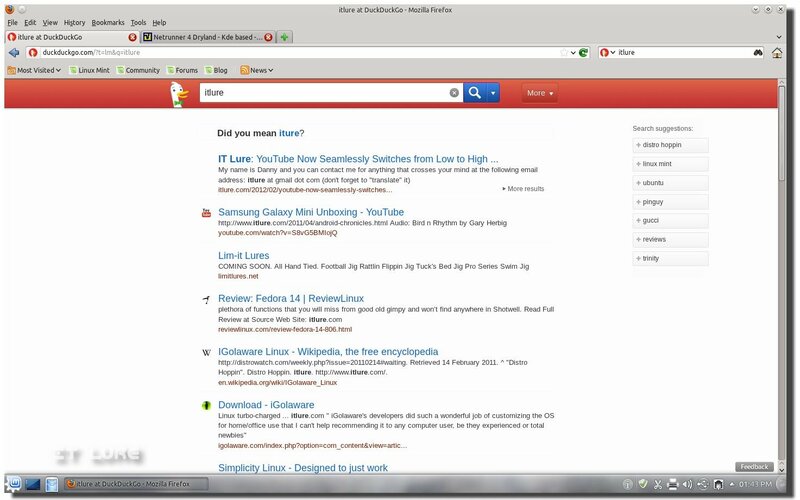 A, you might be in for a little surprise when you open up Firefox: the search field in the top right corner isn't powered by Google anymore, but by the up-and-coming DuckDuckGo, which promises anonymous searching. It certainly does integrate better with the whole open source philosophy, but Google is Google if you know what I mean. Still, if you give it a chance, you will see that DuckDuckGo is very powerful. 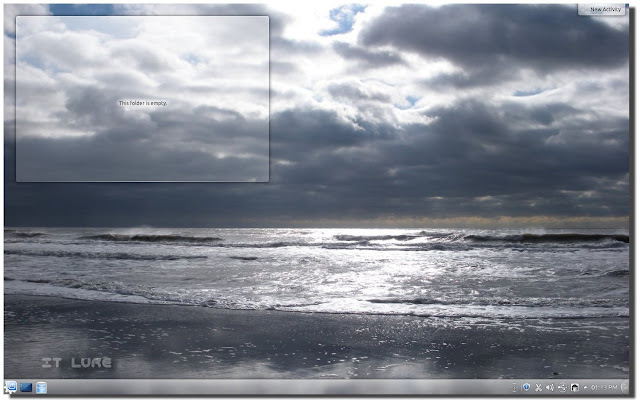 Image searching is done through either Google or Bing. Kopete handled both my Yahoo and Gmail IM accounts just fine, with working file sending and even webcam sharing (albeit horribly looking and moving - bad, bad FPS). Of course, voice/video chat is out of the question. Skype, though not present in the default stack, can be easily installed from the Software Manager. The Multimedia section is composed of VLC, K3b (CD/DVD burner), Amarok and a cool little app called Minitube, which lets you watch YouTube videos without Flash, thus improving the playback smoothness on older machines. While a good resource, if you are an active YouTube user with a lot of subscriptions, it's pretty useless, as Minitube only lets you search for keywords or channels. You simply type whatever you want to see/hear and it creates an auto-advancing playlist for hours and hours of uninterrupted entertainment (or not). LibreOffice takes care of your spreadsheets, documents and presentations, while Okular gladly opens your PDFs. Linux Mint 12 KDE also comes packed with a Domain Blocker, an easy to use backup tool and an Upload Manager. Sadly, this last one does not come pre-configured to use a certain service, and configuring one yourself is not so straight-forward. 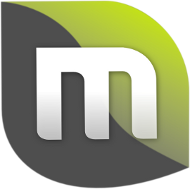 In the past, Linux Mint did collaborate with an online service, making file sharing a piece of cake. In terms of "uuu, shiny!" moments, Linux Mint 12 KDE has its fair share of. The cool bluey glow surrounding every window, minimize/maximize animations, an elegantly futuristic "coverflow"-like alt+tab are some of Lisa's charms. As you would expect, all these effects (and more) are configurable through the "Desktop Effects" control module. It's clear that Linux Mint is at the top for a bunch of very good reasons that converge into one -> it offers a great get-go operating platform for all sorts of users and environments. Fast, responsive, easy to install and use, friendly support and a great community. I like you, Lisa, I really do! The only question: Why do you mention Kubuntu in the forth paragraph? Well done review... I agree that the number of updates for a week-old distro is insane! That doesn't even include KDE 4.8 - sure to be updated in the coming days or weeks. At least they could have bumped the kernel up to the current 'buntu version. The kernel was kept back because of a regression bug. The newer kernel has major issues. That was not a nepomuk crash. It was the system reporting that nepomuk is disabled and akonadi needs it for some functionality. That was not a Nepomuk crash. 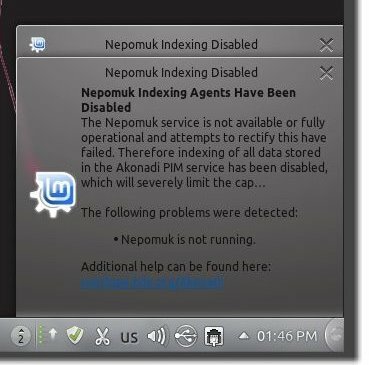 It was just Akonadi reporting that nepomuk indexing is disabled, and Akonadi needs it to be enabled for some functionality. Thanks for pointing it out... The service did need to be enabled from the "Desktop Search" settings pane. if someone has idea how to fix it, will greatly help me. this spin has totally converted me to KDE. very clean, very nice. I agree, i'm a new KDE convert too. This is a very pretty and snappy distro. Needs a fairly decent memory to run well though... with all the fruit it idles at about 1.7G. Up to 4 with a few browser tabs.